Do you ever go to snap a pic or review one you just took and see ‘busy’ on your camera’s lcd display? Think your camera is to blame? It’s not. Your memory card is. CRAZY, I know. If you’re seeing ‘busy’, it may be time for a new card. You should get the biggest, fastest card there is, right? Maybe not. 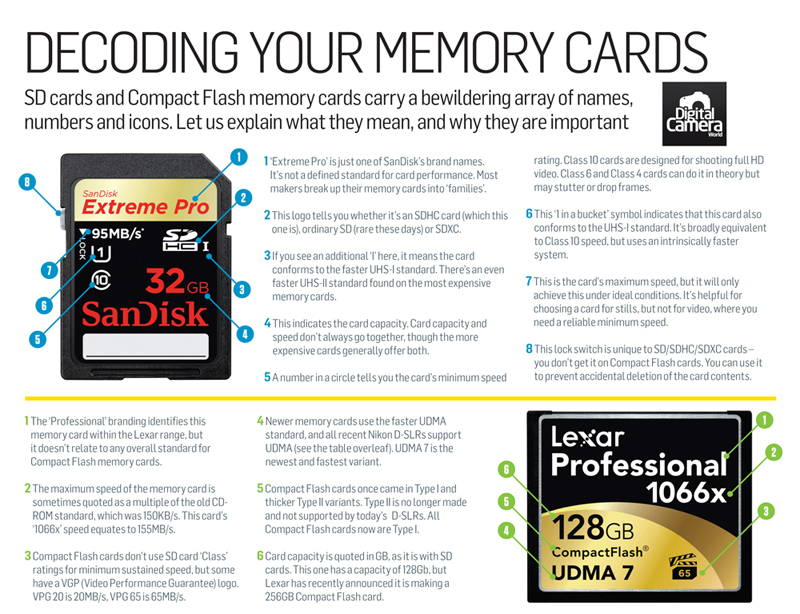 Time to spell out what all those numbers on your memory card mean. Why does it matter? Slower write speeds = shooting lag, but buying the fastest card you can find may not matter if your camera doesn’t support it. More importantly, the number you’re probably using to gauge your card’s speed might not matter at all. Let’s get to it. #7 – This is the number most people look to in determining which card to buy and whether or not that card is ‘fast’. It turns out that this is the transfer rate and not the write speed. For typical photography purposes, you don’t really need this number at all. #2 – This is the card type. Almost all current cameras can handle SDHC cards (which go up to 32gb capacity). The newest, fastest format is SDHX (32gb up to 2TB). Most current cameras can handle SDHX cards, but it’s best to check your model to be certain before purchasing one. Your owner’s manual will have compatibility info or Sandisk has a handy tool. #4 – The card’s overall capacity. Some older cameras can’t handle super high capacity cards, so it’s best to check your manual (or Google) to see if yours does. Tip – It may be wiser to buy two slightly smaller cards rather than a single large one (unless you’re shooting in continuous mode all.the.time). If your giant memory card fails, you have nothing. If you have 2 64gb (or 32gb) cards and one fails (or you leave it in your computer – not that I’ve done that…), you’re still safe for awhile until you can replace the dud. Bottom Line: Which cards do we recommend at SPS? Build quality and support are also very important. There’s nothing more frustrating than have a high file corruption rate (meaning the pic files are damaged) from lower quality cards! Spending a few extra bucks on a nice card is 100% worth it! We here at the SPS compound shoot with Sandisk Extreme Pro cards. Rugged. Reliable. And a great value.